People aren’t speaking up nearly as much as they’d like to at work. One 2017 study finds that just 1% of employees feel “extremely confident” to air their concerns, and roughly 33% believe their organizations don’t support speaking up broadly as a habit. While our research team initially started studying voice as a way of addressing harassment and other high-stakes breaches of ethics, we discovered that speaking up doesn’t just discourage problematic behaviors; it encourages positive ones like creativity, collaboration, and problem-solving. That means when leaders create the conditions for voice, they can make smarter, more creative decisions and root out questionable behaviors before they fester into something larger. People don’t lead in a vacuum. A wide body of research has found that the experience of being in power actually changes the brain. High-status people largely lose their ability to take others’ perspectives; they start focusing more on goals rather than people, and they take more risks in pursuit of executing on their vision. The result: Leaders tend to be less likely to seek out alternative opinions from others. Additional research has found that people run into some predictable obstacles to voice when they witness questionable behavior. For example, groups often fall victim to the “diffusion of responsibility,” in which each member of the group assumes another person will speak up, so no one actually does. People have also been found to rationalize their silence because of fears of retribution or punishment, both to themselves and others. With that science in mind, we’ve concluded that people speak up mostly according to the risks and benefits they’ve assigned to voice—a finding that obliges leaders to create the right conditions in their culture. Specifically, they should be making it feel safer to call things out, and less threatening to get called out. Scripts can be useful when developing a habit that involves minimizing threat. Phrases like “I don’t mean to challenge your status, but…” and “For the sake of this project, …” explicitly try to defuse any possible threat and highlight the larger goal. From there, both sides can feel more comfortable knowing their status won’t be threatened just because of a difficult conversation. When leaders make an active effort to solicit others’ views, they hold the power to radically shift how their organization functions. 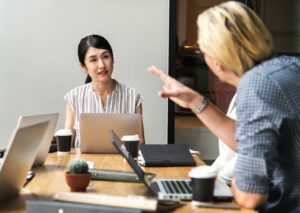 Without false expertise plaguing meetings and silence reigning in moments of questionable behavior, teams will feel empowered to freely debate new ideas, approach colleagues with confidence, and develop greater individual senses of agency. In addition, voice-rich cultures tend to be ones of consequence, since people know they’ll be held accountable for their ideas and actions.